NIT Karnataka Recruitment 2019 - Job notification for JRF Post on a project entitled “Unravelling Submarine Groundwater Discharge (SGD) zones along Indian subcontinent and its islands (Mission – SGD)” in Department of Applied Mechanics & Hydraulics, NIT Karnataka, Mangalore, Karnataka. 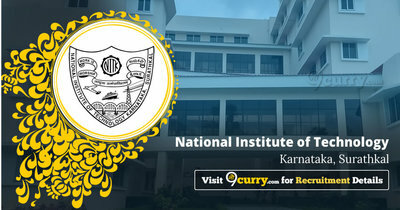 Applications are invited by National Institute of Technology Karnataka, Surathkal on or before 30 Apr 2019 for 1 vacancy. Eligible candidates may send their application in prescribed format (attached below) to Dr. Ramesh, H. Associate Professor, Department of Applied Mechanics & Hydraulics National Institute of Technology Karnataka Surathkal Mangalore – 575025 Email: ramesh.hgowda@gmail.com on or before 30 Apr 2019, along with copies of relevant certificates, grade/mark sheets, publications etc. NIT Karnataka Recruitment 2019 - Job notification for Intel Project Fellow Post on a project entitled " Quantitative Understanding of Energy Efficiency in NFV Frameworks " in Department of Computer Science and Engineering, NIT Karnataka, Mangaluru, Karnataka on Temporary Basis. Applications are invited by National Institute of Technology Karnataka, Surathkal on or before 06 May 2019 for 1 vacancy. NIT Karnataka Recruitment 2019 - Job notification for JRF Post on a project entitled "Design, analysis and development of combined wave and wind energy multi-use platform (COMBINED-MUP)" in Department of Applied Mechanics and Hydraulics, NIT Karnataka, Mangaluru, Karnataka on Temporary Basis. Applications are invited by National Institute of Technology Karnataka, Surathkal on or before 30 Apr 2019 for 1 vacancy. NIT Karnataka Recruitment 2019 - Job notification for JRF Post on a project entitled “Design and Implementation of Multi-Attribute Void-Aware Routing Algorithm for Software-Defined Underwater Acoustic Modems” in Department of Computer Science & Engineering, NIT Karnataka, Mangalore, Karnataka. Applications are invited by National Institute of Technology Karnataka, Surathkal on or before 30 Apr 2019 for 1 vacancy. NIT Karnataka Recruitment 2019 - Job notification for Project Staff Post on a project entitled “Analytical and numerical investigations of mixed convection through wire mesh porous structure filled in a channel” in Department of Mechanical Engineering, NIT Karnataka. Applications are invited by National Institute of Technology Karnataka, Surathkal within 30 days from the date of advertisement for 1 vacancy. NIT Karnataka Recruitment 2019 - Job notification for JRF Post on a project entitled “Multi Graph based Anomaly Detection Model for Social Network Analysis using Machine Learning” in NIT Karnataka, Karnataka. Applications are invited by National Institute of Technology Karnataka, Surathkal on or before 26 Apr 2019 for 1 vacancy.